Nynas Endura F1 is a highly polymer modified hot mix binder. It has excellent workability characteristics and has been specially developed to deliver the optimum balance between toughness and flexibility required by onerous applications such as a race track. The client decided to opt for binder products from Nynas' Performance range. 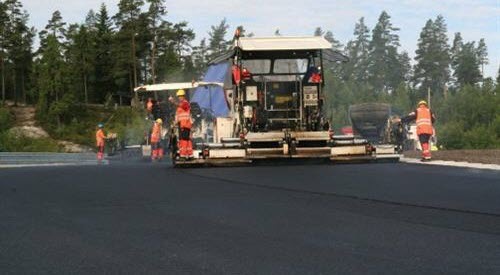 The surface layer comprised a 50mm thick asphalt concrete that used Nynas Endura F1, a bitumen that has excellent workability characteristics. It is highly suitable for onerous applications such as surfacing a race track – resisting cracking and ageing well. Under the surfacing was a 50mm asphalt concrete base course bound with Nynas 160/220. The pavement is expected to provide a long lifespan. Rudskogen Motor Park has developed into a modern racing centre for racing cars and motorcycles, with a circuit that provides flexibility and good capacity. The race track was designed by the renowned German architect Herman Tilke who has emphasised the unique nature of the spectacular scenery and varied terrain the track passes through. The track is designed for all classes of event except Formula 1 and is 3.3km long. Extensive laboratory tests and trial sections were not performed due to tight time constraints. A tailored mix design was crucial, however, to get the required properties. Based on experience, Nynas Endura F1 was chosen as the binder for the surface course. The pavement of the race track will not be subjected to heavy loads from trucks, for instance; but fast cars at high speeds require good skidding resistance and cause high lateral stresses within the material they are running on. The client chose Nynas Endura F1 because it believed the product will help the pavement to control movements in the underlying base structure. There was a risk with a conventional solution involving harder grades of binder that the asphalt would age faster, resulting in cracks and an uneven surface. Uniformity andevenness were critical criteria as far as the client was concerned. The contractor Veidekke Industri was allowed to have just two joints around the 3.3km long track, both of their locations being pre specified. In the event, Veidekke Industri was praised for the evenness of track surface. Endura F1 gives outstanding performance which combines the flexibility of soft bitumen and the durability of polymer modification. 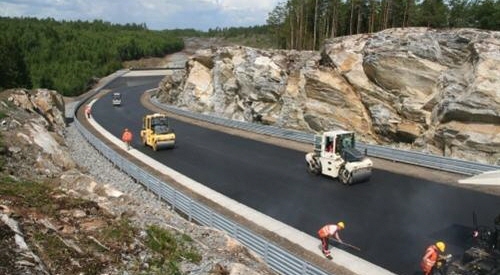 At the Rudskogen race track, the new pavement provides a highly flexible and smooth asphalt surface thanks to the binders used in the tailored mix design. Download this information on how Nynas Endura F1 was used at Rudskogen Race Track, Norway, as pdf.